For my friends at Mozilla, I'm going to keep updating this as I go but Tine, Grace, mcolvig, etc if you've got ideas for sightseeing activities for friends here at Mozilla, that would be great. We've got folks from Japan, Europe, etc. So restaurant ideas, sights, etc. Updated: Check comments and also check out this virtual tour from Riya. It's pretty neat, just drill down to San Francisco. Materials cost me about $2-3,000, and I would value all of this stuff to be about $10-$15,000, but priceless really. 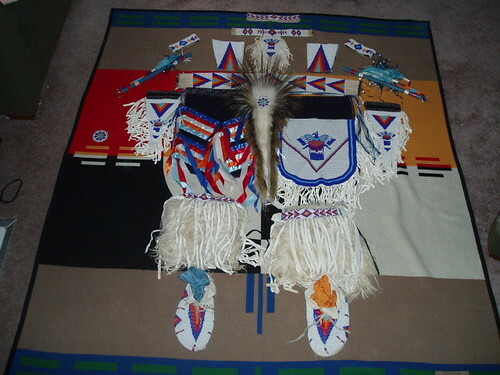 I have sold some stuff before and gave away other beadwork (bags, jewelry, beaded turtles). I need to visit a few folks that I haven't seen in a while, Mrs. Orear an old grade school teacher who's teaching over at St. Isidore's now in Danville, Father Pat who's over at some church near me, and Mr. Anderson (Daddy-yo). I ran into Daddy-yo in January but didn't get to talk to him much. Hadn't been comfortable chatting with him since he had gotten me my first job out of college. I ended up not liking that job very much, left as soon as I could, and high-tailed it over to Netscape. Daddy-yo was Troop 89's Scoutmaster. He's very old school, and is partly why I'm old school. He had one rule to live by that I still follow, take care of your belly and your back. That's it. Makes life easy when you break it down like that – meaning make sure you eat, and have clothes on your back/roof over your head.